This past few months, we have been hearing a lot of news regarding upcoming wearable devices such as the Moto 360 and LG G watch which would be running on Android Wear, Google’s own wearable OS. We have also been hearing about Apple making their own smartwatch, iWatch and have been bombarded with concept designs but most of it aren’t what we expect it to be. It’s time for all of them to just step aside and see the greatness of this new smartwatch in town. 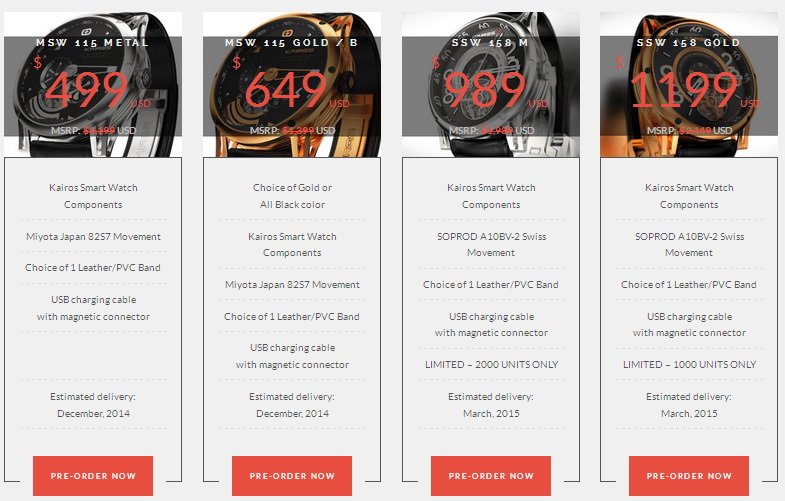 The Kairos Smartwatch is all set to bring those dreams to reality, finally. Smartwatches can be totally digital, but blending the traditional form with a custom smartwatch overlay which is compatible with both Android and iOS is something we would be waiting to see with eagerness. You can call this watch, the hybrid mechanical smartwatch. The overall design language of the watch might not suit everyone, but what is a smartwatch if it doesn’t look like one? Others might have the notion of seeing a smartwatch as a futuristic device with holograms projecting out but if you would love to remain old-school and have the taste of a future in it, Kairos smartwatch should be the ultimate choice for your purchase. The Kairos smartwatch will have a Bluetooth 4.0 LE radio, 180mAH battery which will be capable of running for 5-7 days and a 3-axis acceleometer. At first sight, anyone would claim the watch to be an elegant Swiss watch but the transparent OLED is what makes the difference. The display is under a sheet of sapphire crystal which is also touch sensitive required for the basic interactions and stays blank when not in use. Potential customers will have two versions of the watch: 25 Jewel Sprod A10BV-2 Swiss Automatic movement and 21-Jeweal Miyota 8257 Japanese automatic movement. To have a clear understanding on how the device works, watch the video below. So how much would this cost? The MSW 115 Metal starts at $1199 but if pre-orders are done now, it would only cost $499 whereas the SSW 158 Gold would normally cost $2,149 and if pre-ordered, would cost only $1199. If you want this great piece of device, you better hurry up as the pre-orders for all the models of Kairos Watch are open till the end of June. These are some beautiful watches. Let’s see what the Android Wear devices evolve into.